"♢" redirects here. For the similar typographical element, see Lozenge. This article contains suit card Unicode characters. Without proper rendering support, you may see question marks, boxes, or other symbols. The card suits originated in China, where playing cards were first invented. The earliest card games were trick-taking games and the invention of suits increased the level of strategy and depth in these games. A card of one suit cannot beat a card from another regardless of its rank. The concept of suits predate playing cards and can be found in Chinese dice and domino games such as Tien Gow. Chinese money-suited cards are believed to be the oldest ancestor to the Latin suit-system. The money-suit system is based on denominations of currency: Coins, Strings of Coins, Myriads of Strings (or of coins), and Tens of Myriads. Old Chinese coins had holes in the middle to allow them to be strung together. A string of coins could easily be misinterpreted as a stick to those unfamiliar with them. By then the Islamic world had spread into Central Asia and had contacted China, and had adopted playing cards. The Muslims renamed the suit of myriads as cups; this may have been due to seeing a Chinese character for "myriad" (万) upside-down. The Chinese numeral character for Ten (十) on the Tens of Myriads suit may have inspired the Muslim suit of swords. Another clue linking these Chinese, Muslim, and European cards are the ranking of certain suits. In many early Chinese games like Madiao, the suit of coins was in reverse order so that the lower ones beat the higher ones. In the Indo-Persian game of Ganjifa, half the suits were also inverted, including a suit of coins. This was also true for the European games of Tarot and Ombre. The inverting of suits had no purpose in regards to gameplay but was an artifact from the earliest games. These Turko-Arabic cards, called Kanjifa, used the suits coins, clubs, cups, and swords, but the clubs represented polo sticks; Europeans changed that suit, as polo was an obscure sport to them. The Latin suits are coins, clubs, cups, and swords. They are the earliest suit-system in Europe, and were adopted from the cards imported from Mamluk Egypt and Moorish Granada in the 1370s. There are four types of Latin suits: Italian, Spanish, Portuguese,[c] and an extinct archaic type. The systems can be distinguished by the pips of their long suits: swords and clubs. Northern Italian swords are curved outward and the clubs appear to be batons. They intersect one another. Southern Italian and Spanish swords are straight, and the clubs appear to be knobbly cudgels. They do not cross each other (The common exception being the three of clubs). Portuguese pips are like the Spanish, but they intersect like Northern Italian ones. They sometimes have dragons on the aces. This system lingers on only in the Tarocco Siciliano and the Unsun Karuta of Japan. The archaic system[d] is like the Northern Italian one, but the swords are curved inward so they touch each other without intersecting. Minchiate (a game that used a 97-card deck) used a mixed system of Italian clubs and Portuguese swords. Despite a long history of trade with China, Japan was introduced to playing cards with the arrival of the Portuguese in the 1540s. Early locally made cards, Karuta, were very similar to Portuguese decks. Increasing restrictions by the Tokugawa shogunate on gambling, card playing, and general foreign influence, resulted in the Hanafuda card deck that today is used most often for fishing-type games. The role of rank and suit in organizing cards became switched, so the hanafuda deck has 12 suits, each representing a month of the year, and each suit has 4 cards, most often two normal, one Ribbon and one Special (though August, November and December each differ uniquely from this convention). During the 15th-century, manufacturers in German speaking lands experimented with various new suit systems to replace the Latin suits. One early deck had five suits, the Latin ones with an extra suit of shields. The Swiss-Germans developed their own suits of shields, roses, acorns, and bells around 1450. Instead of roses and shields, the Germans settled with hearts and leaves around 1460. The French derived their suits of trèfles (clovers or clubs ♣), carreaux (tiles or diamonds ♦), cœurs (hearts ♥), and piques (pikes or spades ♠) from the German suits around 1480. French suits correspond closely with German suits with the exception of the tiles with the bells but there is one early French deck that had crescents instead of tiles. The English names for the French suits of clubs and spades may simply have been carried over from the older Latin suits. Beginning around 1440 in northern Italy, some decks started to include of an extra suit of (usually) 21 numbered cards known as trionfi or trumps, to play tarot card games. Always included in tarot decks is one card, the Fool or Excuse, which may be part of the trump suit depending on the game or region. These cards do not have pips or face cards like the other suits. Most tarot decks used for games come with French suits but Italian suits are still used in Piedmont, Bologna, and pockets of Switzerland. A few Sicilian towns use the Portuguese-suited Tarocco Siciliano, the only deck of its kind left in Europe. In a large and popular category of trick-taking games, one suit may be designated in each deal to be trump and all cards of the trump suit rank above all non-trump cards, and automatically prevail over them, losing only to a higher trump if one is played to the same trick. Non-trump suits are called plain suits. Preferans: hearts, diamonds, clubs, spades. Only used for bidding, and No Trump[clarification needed] is considered higher than hearts. Teen patti: In the case where two players have flushes with cards of the same rank, the winning hand is based on suit color as ranked by clubs, hearts, spades, diamonds. The pairing of suits is a vestigial remnant of Ganjifa, a game where half the suits were in reverse order, the lower cards beating the higher. In Ganjifa, progressive suits were called "strong" while inverted suits were called "weak". In Latin decks, the traditional division is between the long suits of swords and clubs and the round suits of cups and coins. This pairing can be seen in Ombre and Tarot card games. German and Swiss suits lack pairing but French suits maintained them and this can be seen in the game of Spoil Five. Some decks, while using the French suits, give each suit a different color to make the suits more distinct from each other. In bridge, such decks are known as no-revoke decks, and the most common colors are black spades, red hearts, blue diamonds and green clubs, although in the past the diamond suit usually appeared in a golden yellow-orange. A pack occasionally used in Germany uses green spades (comparable to leaves), red hearts, yellow diamonds (comparable to bells) and black clubs (comparable to acorns). This is a compromise deck devised to allow players from East Germany (who used German suits) and West Germany (who adopted the French suits) to be comfortable with the same deck when playing tournament Skat after the German reunification. Numerous variations of the 52-card French deck have existed over the years. Most notably, Tarot Nouveau has a separate trump suit in addition to the four suits; however it is a series of cards of a different number and style than the suited cards. There have been many attempts at expanding the French deck to five, six or even more suits where the additional suits have the same number and style of cards as the French suits, but none have attained lasting popularity. Five-suit bridge was an international fad lasting from the summer of 1937 to the summer of 1938 which led to a number of decks produced for it in Austria, Britain, and the United States. A number of the following out-of-print decks may be found, especially through on-line auctions. Previously, Five Star Playing Cards (poker sized) were manufactured by Five Star Games, which had a gold colored fifth suit of five pointed stars. The court cards are almost identical to the diamond suit in a Gemaco Five-Star deck. Five-suit decks using the Star suit are still in print in differing designs through vendors such as Stardeck and Newton's Novelties. Cadaco manufactured a game Tripoley Wild with a fifth suit (and other Wild Cards) which contain pips of all four standard suits (hearts, diamonds, spades, and clubs) on one card. That poker sized deck is not sold separately, but as part of boxed game. Five suited decks include Cinco-Loco Poker Playing Cards, produced by the USA Playing Card Company (not the United States Playing Card Company) which introduces a new suit design. The Cinco-Loco fifth suit uses a complicated pattern, with color designs in a repeating circular series of pentagrams with four traditional suits in a four color pattern, inner circles get increasingly smaller, the fifth symbol in the circle of pentagrams is a yellow pentagram. There are then a total of ten symbols in each of the outer and repeated in inner circles. The other suits use a four-color design. 5° Dimension is an 80-card deck introduced in 2007. The five suits are Hearts (red), Spades (black), Clubs (green), Diamonds (yellow) and Stars (blue). Each suit has 16 cards: 1 to 10, King, Queen, Jack, Princess, Ace (distinct from 1) and a Joker. A commercially available five-suit poker (65-card) deck is Stardeck which introduces stars as a fifth suit. In the Stardeck cards, the fifth suit is colored a mixture of black and red. This fifth suit can be counted as either a Red or a Black suit dependent upon the game being played. There are also 2 special cards (or Jokers), 1 each of red and black and shown with that colour star in the corner, but no numeral or letter. The K6T deck is a six-suited (120-card) deck of poker sized playing cards. The traditional suits are colored (green clubs and orange diamonds) and are completed with blue moons and purple stars. Each suit has 20 cards ranked as 0(=Joker)-1-2-3-4-5-6-7-8-9-10-11-12-J-C(Cavalier for knight)-B(Bishop)-T(Tower for rook)-Q-K-Ace. The courts are representing chess symbols. More ranks, 13-14-15, are sometimes added. A large number of games are based around a deck in which each card has a rank and a suit (usually represented by a color), and for each suit there is exactly one card having each rank, though in many cases the deck has various special cards as well. Examples include Mü und Mehr, Lost Cities, DUO, Sticheln, Rage, Schotten Totten, UNO, Phase 10, Oh-No!, Skip-Bo, Roodles, and Rook. Decks for some games are divided into suits, but otherwise bear little relation to traditional games. An example would be the board game Taj Mahal, in which each card has one of four background colors, the rule being that all the cards played by a single player in a single round must be the same color. 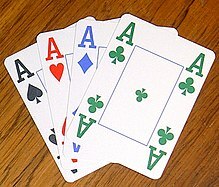 The selection of cards in the deck of each color is approximately the same and the player's choice of which color to use is guided by the contents of their particular hand. In the trick-taking card game Flaschenteufel ("The Bottle Imp"), all cards are part of a single sequence ranked from 1 to 37 but split into three suits depending on its rank. players must follow the suit led, but if they are void in that suit they may play a card of another suit and this can still win the trick if its rank is high enough. For this reason every card in the deck has a different number to prevent ties. A further strategic element is introduced since one suit contains mostly low-ranking cards and another, mostly high-ranking cards. Whereas cards in a traditional deck have two classifications—suit and rank—and each combination is represented by one card, giving for example 4 suits × 13 ranks = 52 cards, each card in a Set deck has four classifications each into one of three categories, giving a total of 3 × 3 × 3 × 3 = 81 cards. Any one of these four classifications could be considered a suit, but this is not really enlightening in terms of the structure of the game. In Robert Asprin's MythAdventures series, Dragon Poker is played using a standard deck, but with the suits consisting of elves, ogres, unicorns and dragons. The Royal Navy Fleet Air Arm search and rescue units (helicopters, etc.) sport an ace of clubs symbol. In Homestuck, the four suits are used to represent the four "Quadrants" (forms) of romance in Troll society. Matespritship, in the Flushed Quadrant (Hearts), is very similar to human romance. Moirallegiance, in the Pale Quadrant (Diamond), is essentially a romantic understanding of best-friendship, but more intense. Generally, morails keep their morails from killing other people. Auspisticism, in the Ashen Quadrant (Clubs), is a three-way relationship where one mediator prevents two others from entering Kismesissitude, due to such a kismessitude being inadvisable. Kismesissitude, in the Caliginous Quadrant (Spades), is a form of rivalry best described as "Romantic Hate." Many characters in Deltarune are based on playing card suits, some using designs from a set of cards created by Tumblr artist Kanotynes. Unicode is the most frequently used encoding standard, and suits are in the Miscellaneous Symbols Block (2600–26FF) of the Unicode. Other expressions drawn from bridge and similar games include strong suit (any area of personal strength) and follow suit (to imitate another's actions). ^ "Portuguese" is slightly misleading nomenclature. The suit system may have originated in Catalonia and spread out through the western Mediterranean before being replaced by the "Spanish" system. The association with Portugal comes from the fact that they continued to use it until completely going over to French suits at the beginning of the 20th century. ^ Probably associated with the Duchy of Ferrara and likely abandoned after the 15th century. ^ The French suit system is generally considered to be separate from the Germans and Swiss due to its different set of face cards. However, when comparing only the pips, it is Germanic. ^ There does not appear to be a single universal system of correspondences between Swiss-German and French suits. Cards combining the two suit systems are manufactured in different versions with different combinations of suits. ^ The shape of the clubs symbol is believed to be an adaptation of the German suit of acorns. Clubs are also known as clovers, flowers and crosses. The French name for the suit is trèfles meaning clovers, the Italian name for the suit is fiori meaning flowers and the German name for the suit is Kreuz meaning cross. ^ In the Germanic countries the spade was the symbol associated with the blade of a spade. The English term spade originally did not refer to the tool but was derived from the Spanish word espada meaning sword from the Spanish suit. Those symbols were later changed to resemble the digging tool instead to avoid confusion. In German and Dutch the suit is alternatively named Schippen and schoppen respectively, meaning shovels. ^ Parlett, David (1990). The Oxford Guide to Card Games. Oxford: Oxford University Press. pp. 27–34. ^ McLeod, John. Games classified by type of cards or tiles used at pagat.com. Retrieved 24 March 2017. ^ Pollett, Andrea (2002). "Tuman, or the Ten Thousand Cups of the Mamluk Cards". The Playing-Card. 31 (1): 34–41. ^ Mann, Sylvia (1974). "A Suit-System Subdivided". The Playing-Card. 3 (1): 51. ^ McLeod, John. Games played with Latin suited cards at pagat.com. Retrieved 10 November 2015. ^ Wintle, Adam. Portuguese Playing Cards at the World of Playing Cards. Retrieved 26 March 2017. ^ Dummett, Michael (1990–1991). "A Survey of 'Archaic' Italian Cards". The Playing-Card. 19 (2, 4): 43–51, 128–131. ^ Gjerde, Tor. Italian renaissance woodcut playing cards at old.no. Retrieved 26 March 2017. ^ Meyer, Huck. Liechtenstein'sches Spiel at trionfi.com. Retrieved 24 March 2017. ^ Dummett, Michael (1980). The Game of Tarot. London: Duckworth. pp. 14–16. ^ Berry, John (1999). "French suits and English names". The Playing-Card. 28 (2): 84–89. ^ McLeod, John. Card Games: Tarot Games at pagat.com. Retrieved 10 November 2015. ^ McLeod, John. Mechanics of Card Games at pagat.com. Retrieved 24 March 2017. ^ Parlett, David. The Language of Cards at David Parlett Gourmet Games. Retrieved 24 March 2017. ^ Leyden, Rudolf von; Dummett, Michael (1982). Ganjifa, The Playing Cards of India. London: Victoria and Albert Museum. pp. 52–53. ^ "Kartenbilder" (in German). deutscherskatverband.de. 17 January 2012. Retrieved 12 December 2012. ^ McLeod, John. Packs with extra suits at pagat.com. Retrieved 1 February 2018. ^ Dawson, Tom; Dawson, Judy (2014). The Hochman Encyclopedia of American Playing Cards - Volume 4 (2nd ed.). New York: Conjuring Arts Research Center. pp. 268–274. ^ Wintle, Simon. Five Suit Bridge at the World of Playing Cards. Retrieved 1 February 2018. ^ Zaloga, Steven J (2007). US Airborne Divisions in the ETO 1944-45. Osprey Publishing. p. 58. ^ Martin, Gary. "'In spades' - the meaning and origin of this phrase". Retrieved 24 March 2017.